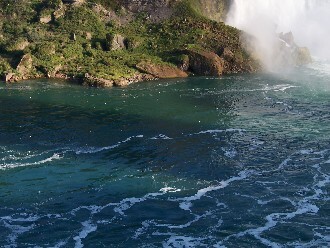 How do you lose something as big as Niagara Falls? I do not know, but I managed to do so. 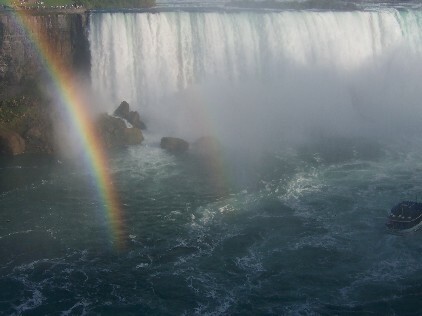 As I was processing my photo inventory I came to realize all the pictures I took at Niagara Falls in September of 2005 were missing. They were not previously processed. They were not in the normal sequential folders waiting for processing. And, they were not in any of the many back-up disks I had made. I suspect this occurred in 2007 when I had to clear my hard drive to battle a virus. CDs were my primary back-up media, which took a lot of time. I did not make the triple back-up then that I do now using external hard drives and USB thumb drives. In fact, I take so many pictures, I was always running behind making backup copies, especially for images I had not processed yet and given their permanent folder and file numbers. Such is life — stuff happens. I have since calculated I lost between 5000 and 6000 images, which, as it turned out, had neither been processed or backed-up yet. 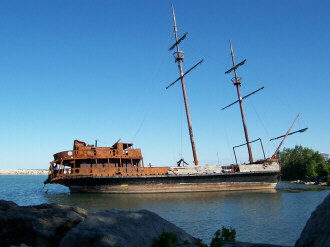 Some places like Fort Henry in Ontario, or the Detroit Zoo, were completely gone. 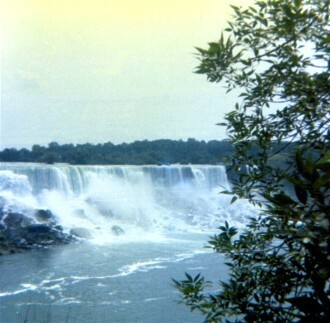 A few places like Niagara, and New York City, I was able to partly retrieve images which I had already shared with others, plus several reduced (in size) images I had copied into my exercise folders. 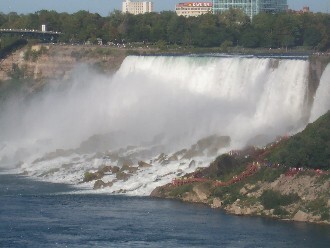 This page is called "Niagara Falls Plus" because I am including a couple of other stops we have made in Ontario; one right before Niagara on September 24, 2005, and the other of Ball's Falls, a part of the Niagara Peninsula, on August 22, 2006 almost a year after our visit. 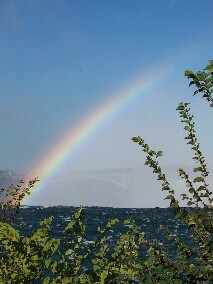 Actually, Niagara Falls was itself just a stop on the way to the Burlington, Vermont area to visit my son and daughter-in-law. 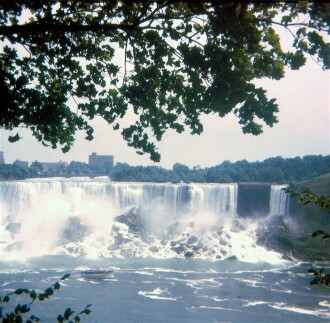 Donna had never been to the falls, so we put it into our itinerary for an afternoon visit. Her reaction was actually rather funny. 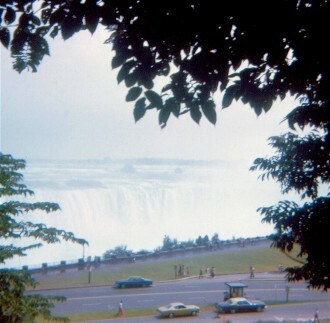 This was not even their busy season, and we were still in the car, but when Donna saw how much traffic there was, and the hoards of people — once she caught a glimpse of the falls as we were approaching a parking area — she said, "OK, I have seen the falls, now we can go." 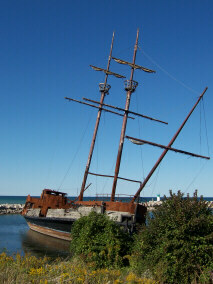 I was the one who insisted we should park and at least take a walk (and get a few pictures, of course). First I will share several photos I took of that area on the way in 2005. 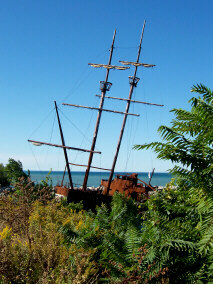 From the highway, I noticed an old ship beached close to the shoreline. 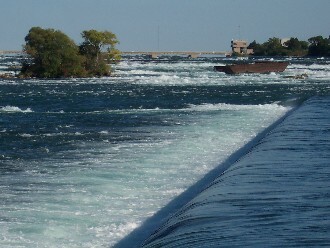 We were a few miles from the falls still, but I was able to find an exit to a side road which wove its way over by the ship where we could pull off and get out of the car. I cannot tell you where. Any notes I might have had disappeared with the lost image files. 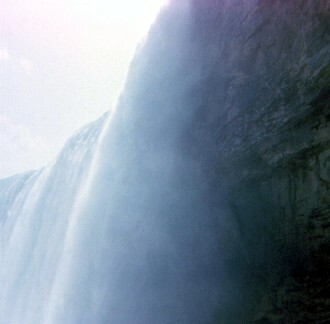 Next will be the Niagara Falls pictures. 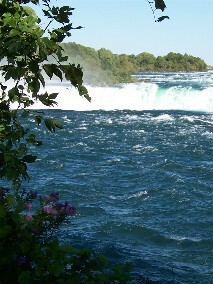 Following those I have included some photos of Ball's Falls. 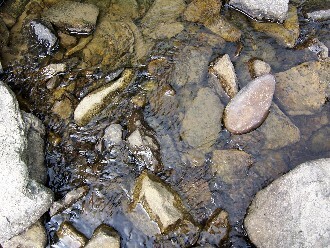 The one thing I do remember is that we were there at a very low water time of the year. Historical pictures in a display showed the dramatic change when spring thaws arrive. 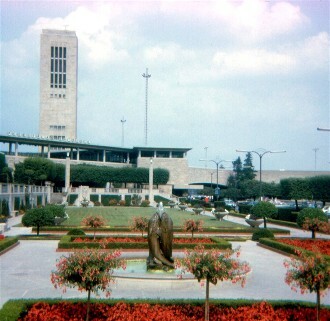 Unfortunately, any pictures I took of the historical images, to show the comparison, were also among the lost photo files. 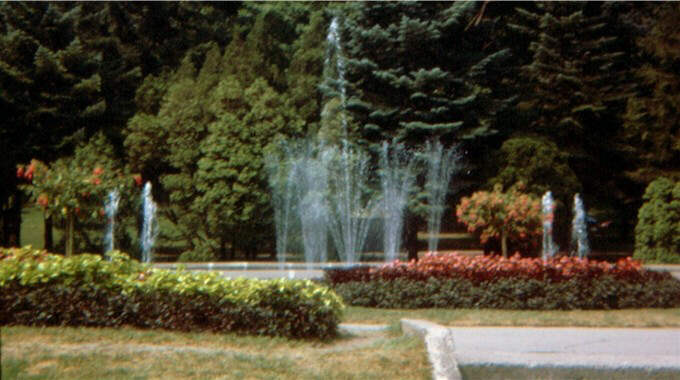 Then, to finish things up, I will add some scanned images of pictures I took back in 1973 with my Kodak 126 Instamatic camera. 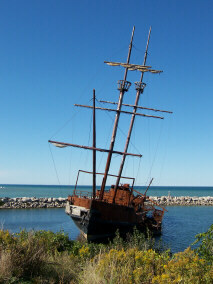 The shipwreck, though the focal point, was not the only thing to take pictures of. 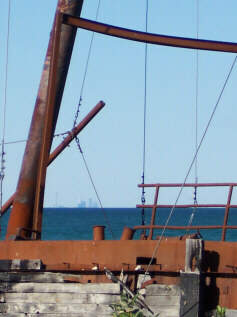 The below left shot, looking through the wreckage, I have included because of the Toronto skyline on the horizon. 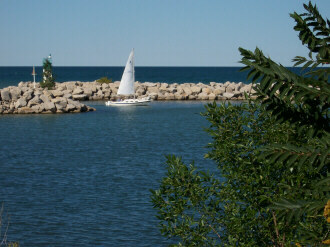 Below right is a beach area along the shore, and the remaining two images are of smaller sailboats which entered the channel while we were there. 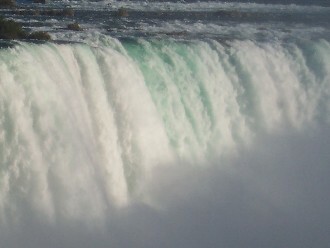 I managed to salvage 151 images from Niagara (only 19 are displayed here), but they are all of the water. None of the shots of the surroundings or attractions were shared yet or used elsewhere, so I had no way of retrieving them. 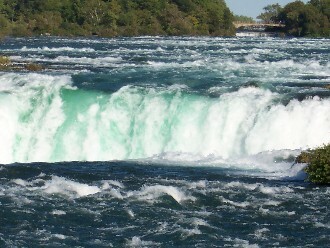 There is an abundance of information available on the Internet about Niagara Falls. 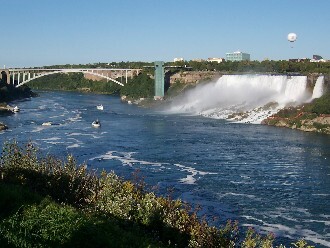 The cities of Niagara Falls in Canada and Niagara Falls in the USA both have official tourism sites. 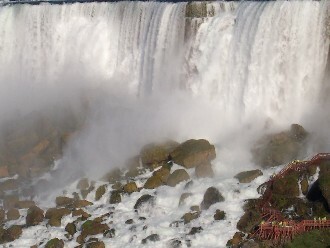 The only one I have linked in my Scrapbook Photos Links page is the "Facts about Niagara Falls" which is just one page on a larger site. 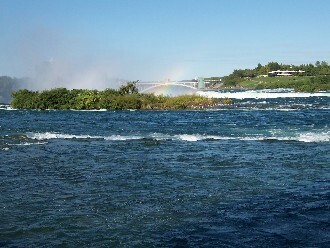 The full URL was too long to fit in the box (http://www.niagarafallslive.com/facts_about_niagara_falls.htm), but the link will take you to it. 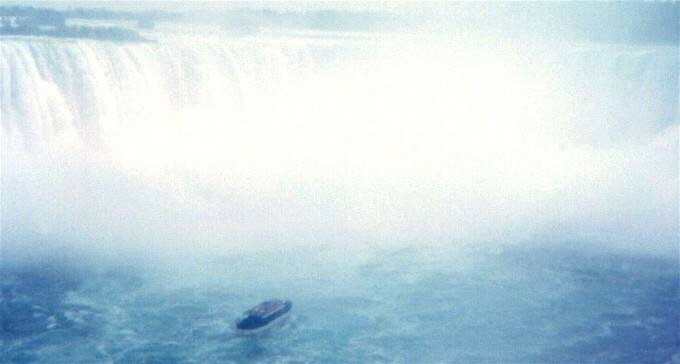 An historical picture from the time when an ice block stopped the flow over the falls was a particularly interesting photo. 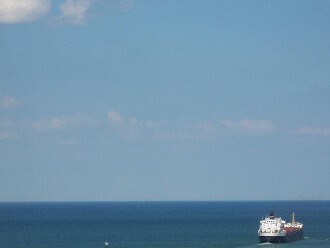 Both of the above images, taken from the car as Donna was driving, have an 'M' at the end of their photo number. 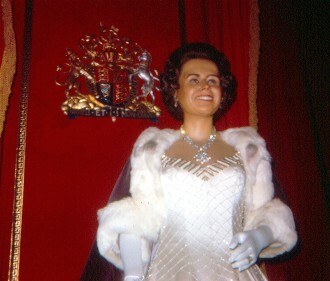 This is how I identify a picture I digitally modified. Looking at the shots though, I cannot remember for certain what it could have been, since I normally do not "touch up" a photo, except for over or under exposure, or when the camera got the colors wrong. Perhaps there was a utility line peeking through the gap in the trees (above left) which drew my eye enough to remove it. 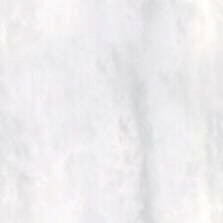 Or, maybe an undefined black spot was in the (above right) image. Quite honestly, there is not enough to the picture to even hint at what I would have found that annoyed me enough to change it. I take a lot of pictures traveling at high speeds while Donna is driving. Rarely do they get used for much except backgrounds. 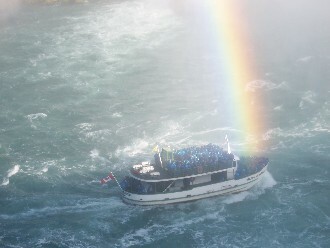 A Niagara tourism website describes Ball's Falls as "a pearl suspended on the string of the Bruce Trail. 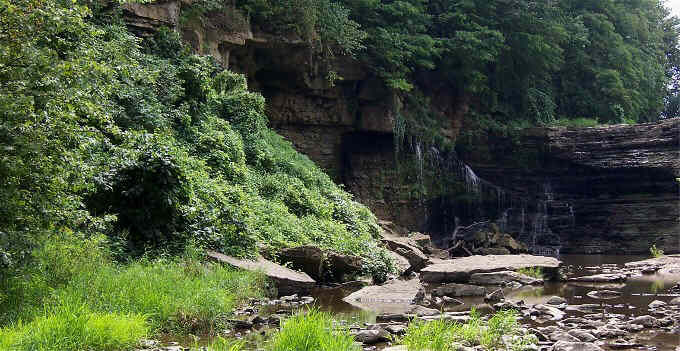 Once an early 19th century hamlet, this site, perched on the edge of the escarpment, features an operational mill, two waterfalls, numerous historic buildings, and lovely nature trails." We did not know anything about it when we stopped. I simply saw what appeared to be a waterfall on the map, and we decided to check things out. As mentioned, the only pictures I managed to salvage from here were those with water in the shot, which I had already shared. I remember seeing some historical displays and information but I do not think all of the buildings were open the day we visited. 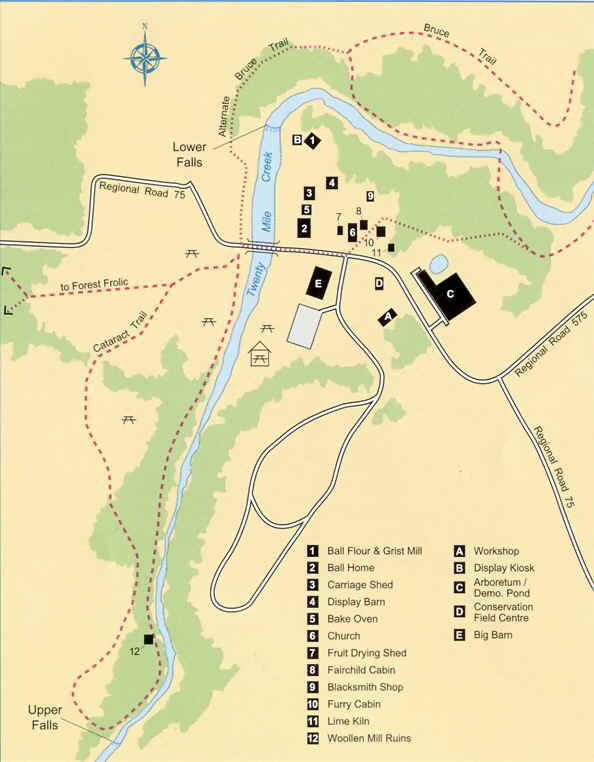 "Ball's Falls Heritage Conservation Area comprises over 200 acres of the original 1,200 acres of land purchased by John and George Ball in 1807. 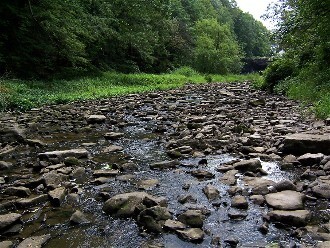 George Ball constructed a gristmill, saw mill and woolen mill on his property, which lead to the establishment of one of the first communities along the lower reaches of Twenty Mile Creek. 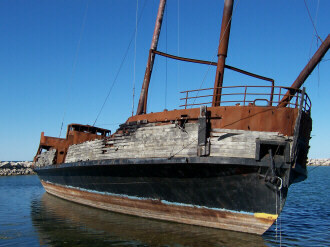 By the late 1830's and early 1840's a prosperous commercial operation had been established. 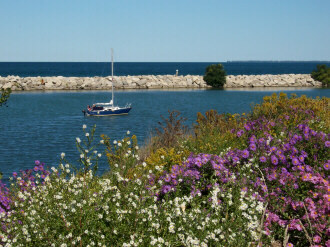 For many a settler in early Niagara, the barrels of flour, smoked meat, yards of cloth, and sawn lumber were only a few of the many supplies that made a stop at this early industrial hamlet essential. 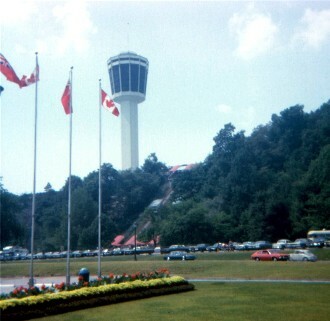 Significant developments, such as the railway and the Welland Canal, triggered the rapid growth of other villages below the escarpment and by the turn of the century most activities at Ball's Falls had ceased. 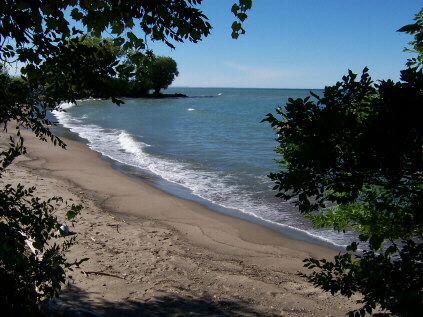 Geology – Bedrock formations of the Niagara Peninsula were formed during the Ordovician and mid-Silurian Periods of the Paleozoic Era time period – roughly 500 to 420 million years ago. 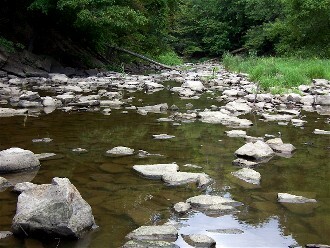 Since that time, erosion and depositional processes have continually altered the landscape. 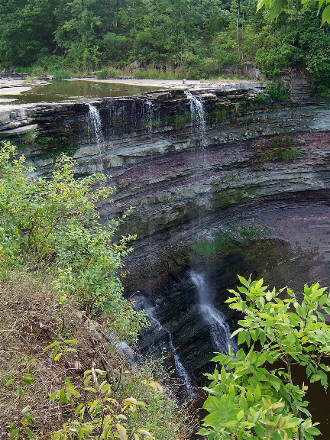 The rock units exposed at Ball's Falls represent almost the complete sequence of Silurian stratigraphy of the Niagara Peninsula and provide an excellent reference section for early and middle Silurian geological history along the Niagara Escarpment. 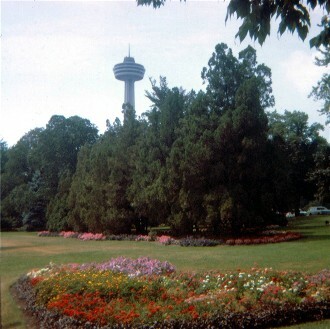 Flora & fauna – A tremendous diversity of flora and fauna is present at Ball's Falls. 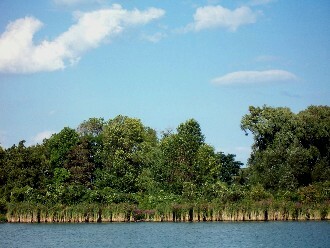 Approximately 471 species of vascular plants exist within the Conservation Area boundaries. This variability of available cover and habitat, from open fields and woodlots to escarpment crevices, supports a variety of wildlife. 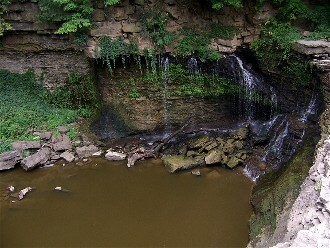 Roughly 53 species of mammals, 36 species of amphibians, reptiles, and many fish species inhabit Ball's Falls." 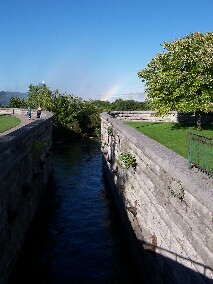 Initially, upon arrival, we crossed the water on a foot bridge. 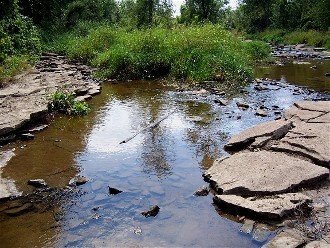 This is where I took that first picture of the cart crossing the creek bed. 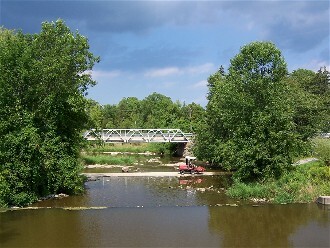 The bridge in that photo would be Regional Road 75 on the map. 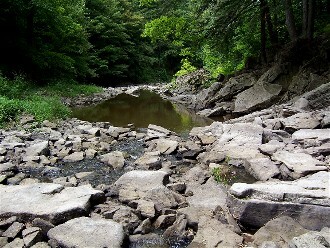 Then we walked along the trail leading to the upper falls. 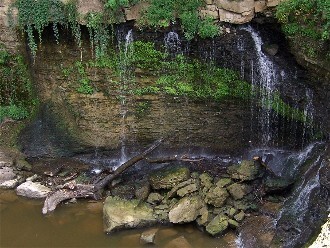 There was not much water coming over the falls, and climbing above the falls you could walk out onto the rocks forming a good portion of the creek bed (images immediately above). 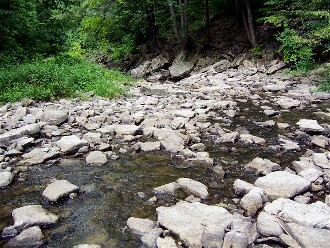 It was only later that I saw pictures of how much water rushes through here at various other times of the year. 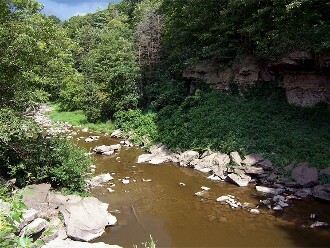 As we departed the upper falls, Donna headed back onto the trail and I moved along the creek bed for a while taking pictures. Once I rejoined her on the trails I continued shooting, but those photos are among the lost. 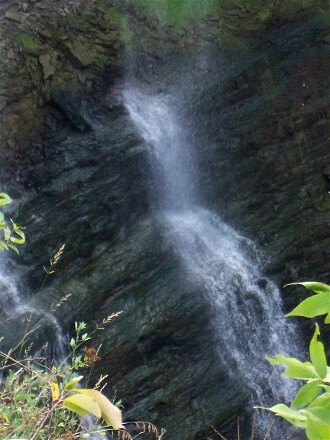 The only other images I have are of the lower falls, which we did not initially even realize were there. 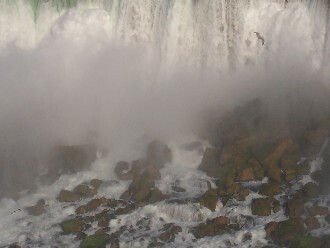 I recall a similar circumstance at Burgess Falls in Tennessee. 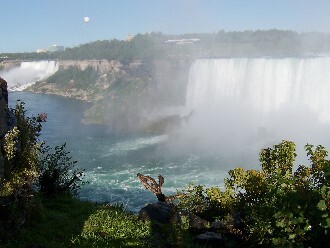 Someone suggested we see the falls at a park before we left the area. 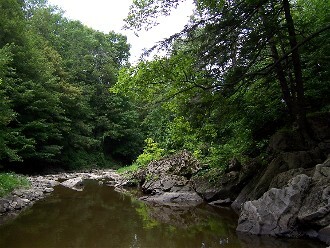 We hiked to what we thought was the falls, which was nice, but nothing spectacular. Following the river to return to the parking area we discovered two more falls along the narrow route, each one bigger and more dramatic that the last. 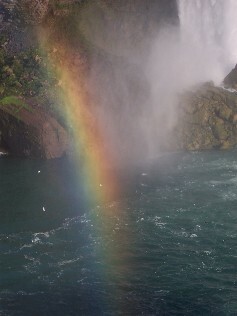 The final one was indeed quite spectacular, just as the lower falls here turned out to be. 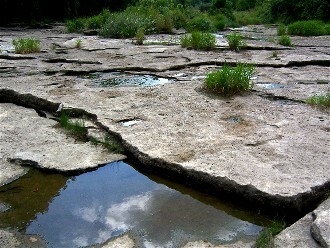 Although it is the rock formations which tell the story with the minimal flow of water on this visit, the historical photos showed a very dramatically different scene. Snow melts or heavy rains obviously change the situation entirely. I could go back again. 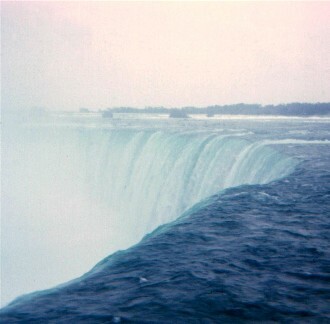 The early seventies was not my first visit to Niagara Falls. We went as a family when I was a child. 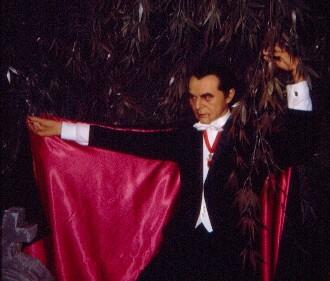 In 1973 I did a little more sightseeing than in 2005, including a visit to the wax museum, which I liked. 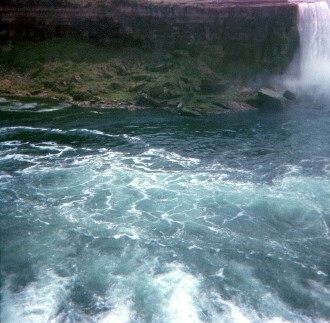 I also have the typical tourist shot from beneath the falls; two tones of very dark, barely defining the rocks from the water. I will not bother to share that one with you. 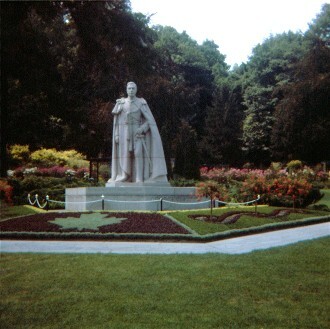 All of these pictures were taken with a little Kodak 126 Instamatic camera I had during college.